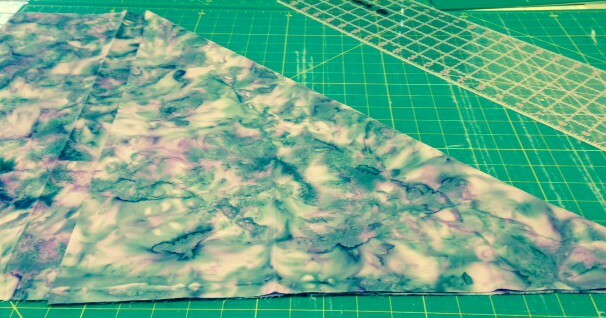 ← THE CALGARY SEWING SHOW IS ALMOST HERE – SEE YOU THERE!! 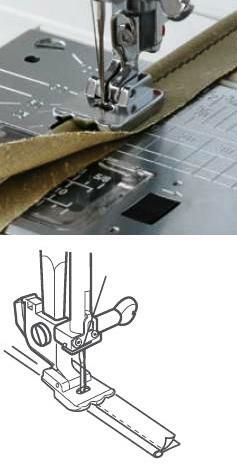 PIPING FOOT FOR ELNA SERGERS – there are few different ones for different model sergers so please check with your local ELNA dealer who can advise you what is available for your specific ELNA serger model. This foot allows you to insert piping into a seam AND finish the seam with a serged overedge at the same time. Very useful in many applications. 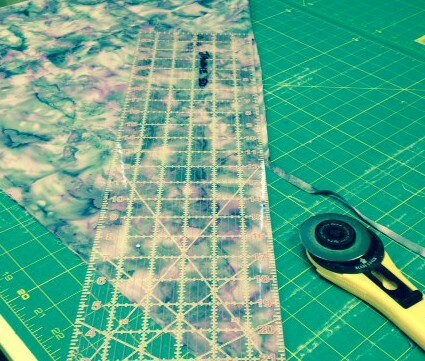 Now use the rotary cutter & ruler to cut strips of bias fabric to cover your piping cording. Cut as much as you need and join strips together as necessary. 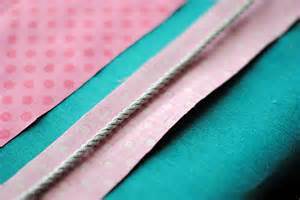 Suggestion: cut strips wide enough to fold over & around the cord and still give you enough fabric to work with for insertion into the seam. You can always trim this down later – much better than fiddling with too little fabric! My strips were 1 1/2 inches wide. 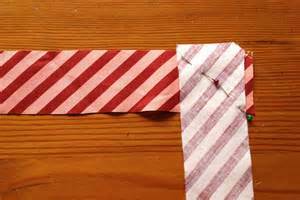 Here’s a tip: cut those 45 degree angles off the ends of your strips to join. Place then RST as in pic and sew the bias seam diagonally as shown with the pins. I do not usually pin. I lay the ends overlapping by a 1/8 – 1/4 inch so I can see where to start & stop my seam…..really clever so I now frequently use this tip I learned along the way. Now you need the piping cord. I prefer to use cotton although poly or nylon cording will also work. 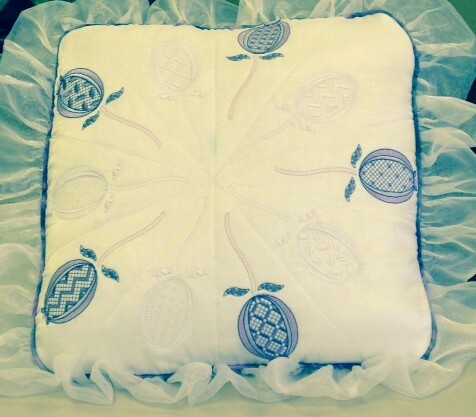 If cotton it MUST be pre-shrunk or your piping will “wrinkle” later when you wash the item. Just put in a bowl and pour boiling water over the cotton cording. When cool, hang to drip dry. Rat tail also works well – you do not need to pre-shrink rat tail & other similar poly or nylon products. If you want to make micro piping (baby items or doll’s clothes etc), then use crochet thread or similar as your cording. 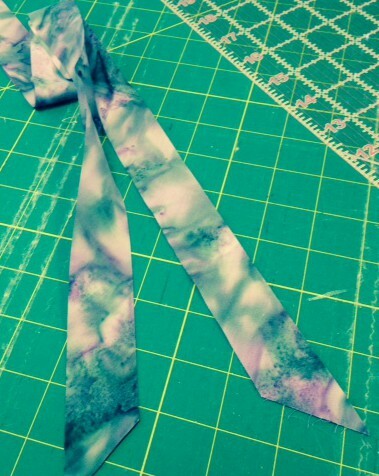 Lay the cording inside the piping fabric strip & fold over enclosing the cord. I find it helps to use my fingernail to crease up against the cord to keep it real snug in the fold. I do this & sew for a bit, stop, push into the fold again & sew some more. Why are there 2 grooves under the foot? That is because you can make double piping or welting with this foot…..but that is for another day! AND, of course, you would use this same piping foot when you insert the piping into the item you are making….pillow? dress? skirt? the list is endless. This is where the Piping foot is INVALUABLE. Ride the foot over the cord using one of the 2 grooves under the foot. 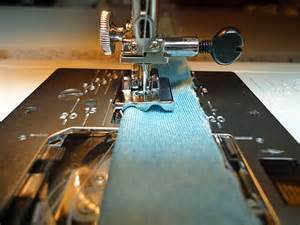 Adjust the needle position so that you are sewing the cord snugly into the fold of the fabric. 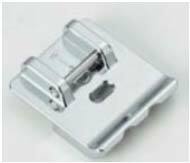 This entry was posted in ELNA IN CANADA, ELNA SEWING ACCESSORY ATTACHMENTS, ELNA SEWING ACCESSORY FEET, Uncategorized and tagged ELNA PIPING FOOT, MAKING YOUR OWN PIPING USING THE PIPING FOOT. Bookmark the permalink.